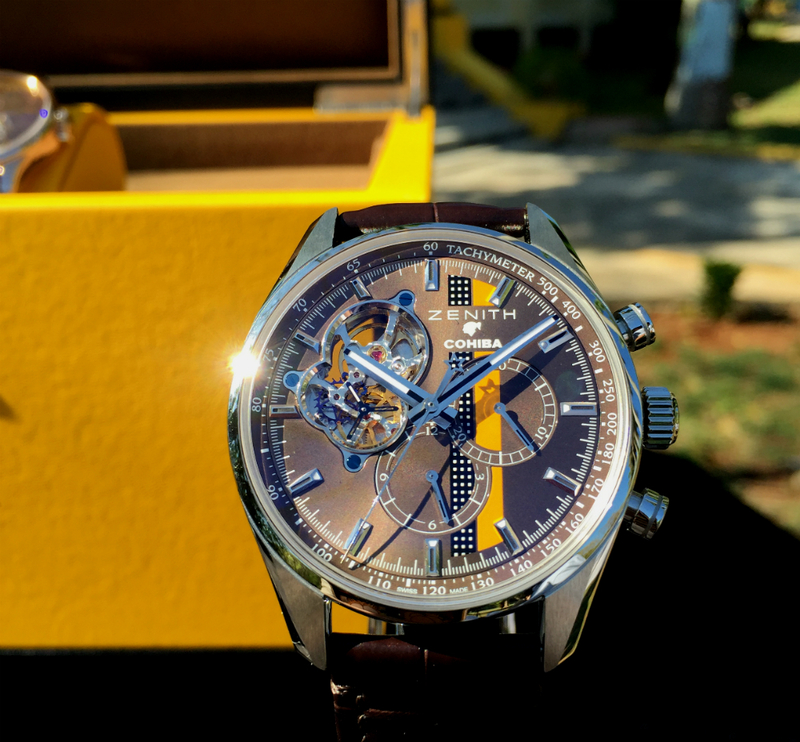 Alfred Lung at aBlogtoWatch visited Havana, Cuba with Zenith for this story. The annual Baselworld fair in Switzerland is often a mixture of hard work, constant back-to-back meetings, and the excitement of learning about new watches, products, and directions our favorite brands are taking over the next year. After a hard day at this year’s conference, a friend and I lit a cigar and puffed away the stress of the daily grind. Like most who have the social media bug, I posted a picture of me savoring my cigar at the end of the day. At the beginning of May, I was surprised when my friends at Zenith had recognized my passion for cigars. 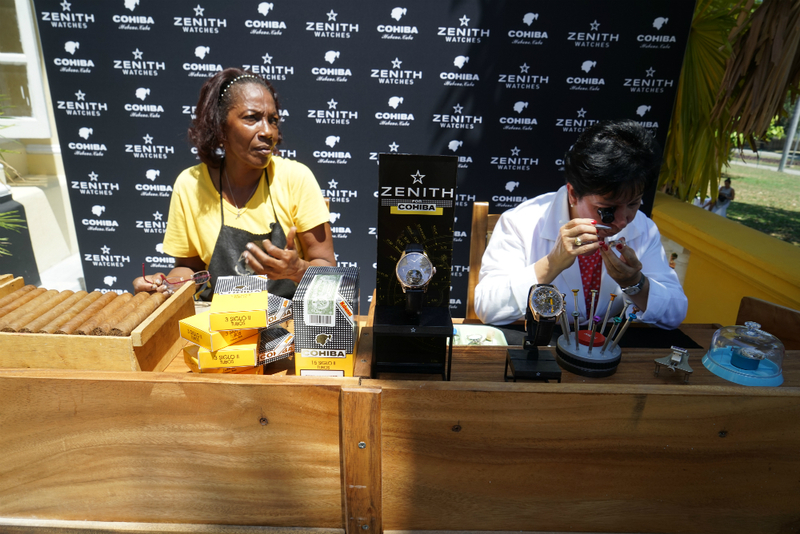 Zenith informed me that they are producing some co-branded watches with Cohiba cigars and asked if I would be interested in traveling to Cuba to learn more. As a cigar and watch enthusiast, it was impossible for me to turn the offer down, despite 30 hours of flying time to get there from Hong Kong. I landed in a hot and humid city. Havana’s worn and shabby aesthetics fade behind a vibrancy and untainted soul. The internet is an expensive luxury, so much so that access to social media and apps that we take for granted was almost impossible. But this forces you to focus on the real and the material in front of you. 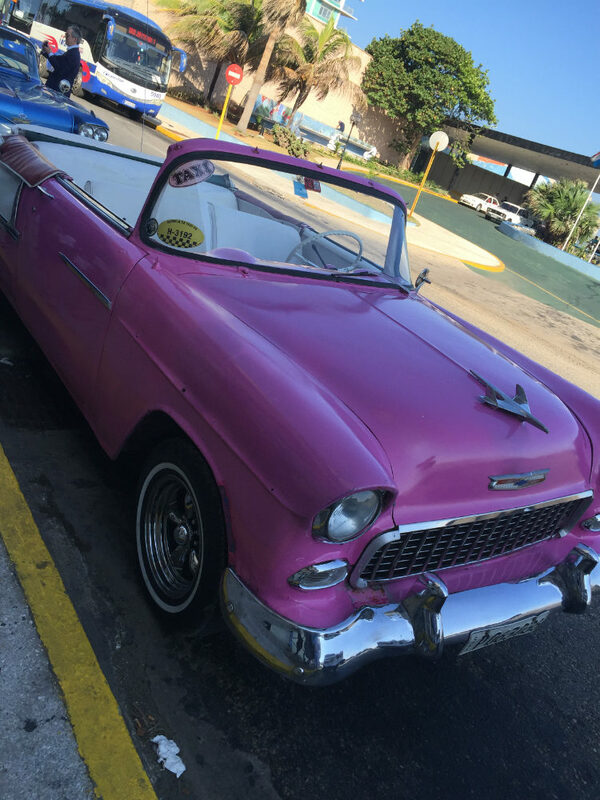 Beautiful old cars and colonial buildings mix with intoxicating Latin music, sumptuous food and a warmth and playful spirit in every Cuban you meet. The country’s spirit simultaneously asks you to enjoy the present and relax to contemplate past success and future glory. 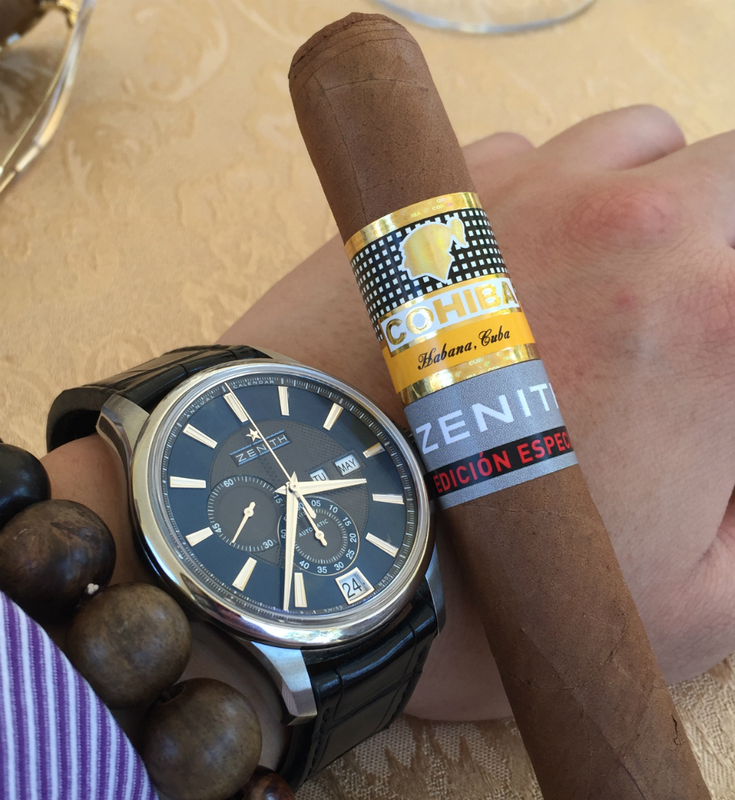 The next morning, I met Mr. Aldo Magada, the dynamic CEO of Zenith watches. 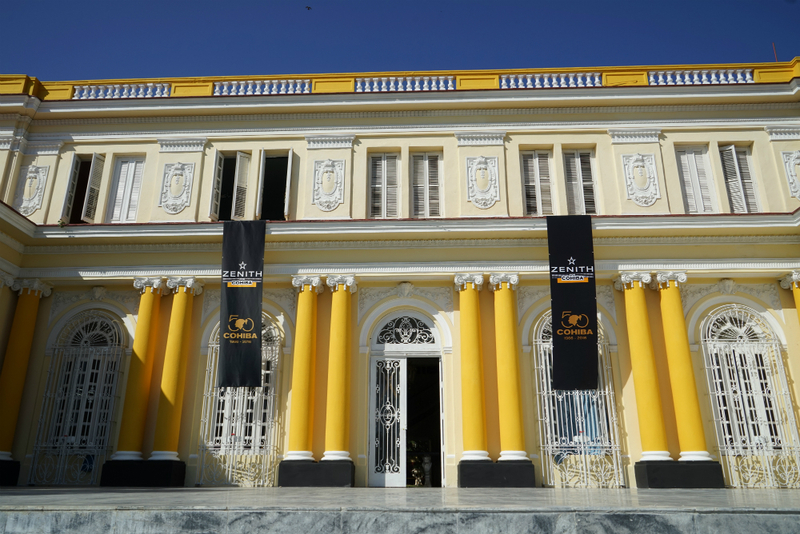 Together we travelled to the co-branded watch unveiling at the Habanos factory. 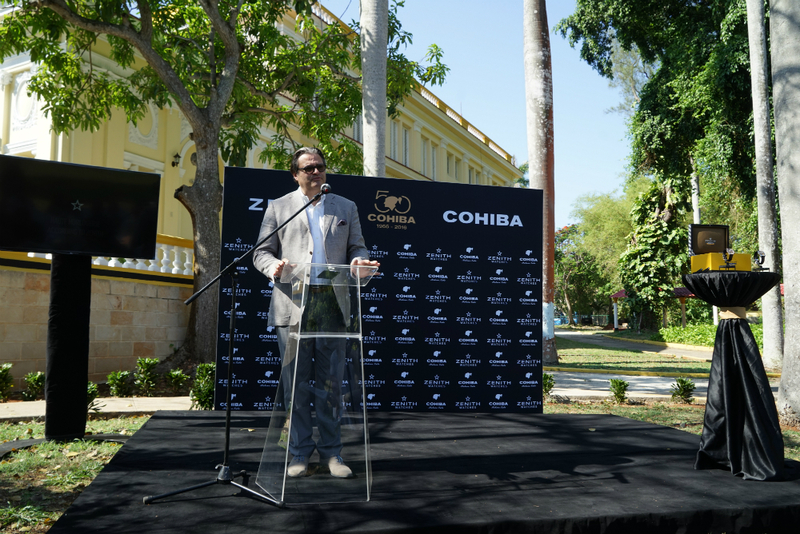 The collaboration is to celebrate the 50th anniversary of the legendary cigar brand, Cohiba. Zenith and Cohiba are celebrating the anniversary with three watches, the Christophe Colomb in rose gold, along with an El Primero Chronograph in rose gold and one in steel. What is immediately apparent is that both Zenith and Cohiba’s DNA and brand identities are central to the watch designs. After the press conference concluded, I had the pleasure of trying the watches on whilst enjoying Cohiba’s cigars. I immediately gravitated to the Christophe Colomb. Like its predecessor, the sapphire crystal ball looks big but never sat uncomfortably on my wrist. What was an immediate pleasure in the new design is the visibility of Cohiba’s DNA and branding. The dial color and texture are instantly recognizable to fans of Cohiba cigars. Eye catching, soulful, and fun, the Christophe Colomb embraces the enjoyment of Cuba and the sophistication of Switzerland. Like the colonial buildings or beautiful 1950s cars that patrol Havana’s streets, this watch will still be in style for many years to come. 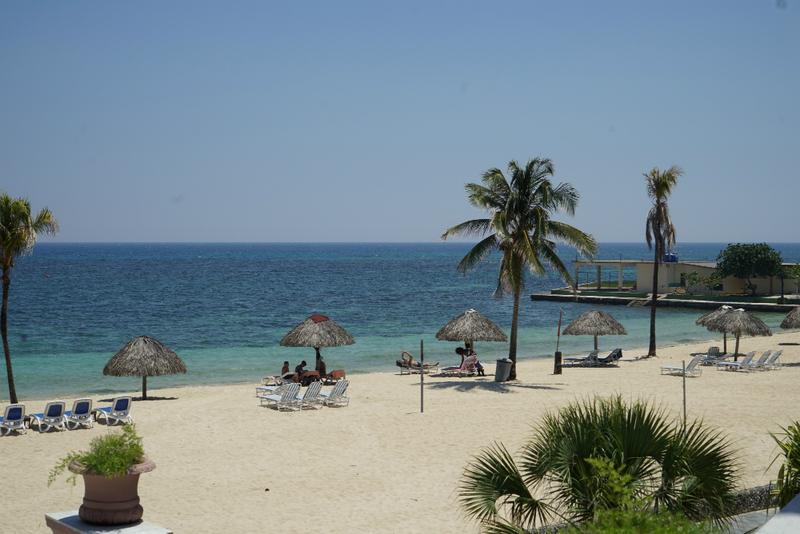 A pleasant trip to see the unveiling of the Zenith/Cohiba collaboration ended with lunch alongside Aldo at a beach side club, I had the chance to catch him for an interview. Alfred Lung: Thank you very much for inviting me to Cuba. This is my first interview with the new CEO of Zenith watches since Mr. Dufour left. First of all, I would like to ask you, what is your definition of haute horology? Aldo Magada: Well, haute horology for us at Zenith is more, let’s say, a laboratory of research and finding new ways of expressing solutions for problems – like the zero gravity on the Christophe Colomb. So apart from our unique haute horology creations, more important for us is the industrial scale production, the stability it brings, and, I would say, the quality it delivers to the consumer. As you know, we are a true manufacturer. For me, the manufacturer is not only about having your own calibers, but also to able to equip 100% of production with our own calibers. There are only very few [brands] who are able to do that. Since ETA began to limit supply, many brands started offering their own movements. And they could be great movements, but they only represent 15% – 20% of their production. We are delivering 100% of our products with manufacturer standard, same as Patek, as Rolex, etc. And I think it’s important when you take responsibility for having not only designed the case, but also the engine. Toward the consumers, you have a great responsibility to ensure that the people are happy when they are buying, and happy for the long term. That also means we are totally capable to maintain all the El Primero movements. You know, El Primero is 47 years old, so you can imagine the number and different kinds of El Primero calibers we have released. So that’s something which is also part of the brand’s responsibility to the consumers, to maintain the product for a long time because it is we alone who must please the consumers when they put the credit card on the counter. We want to make sure that he is happy for the long term. Alfred: A lot of consumers think a watch is eternal in many ways because it can be restored. So are you saying that you can restore nearly all the watches Zenith has sold? Aldo Magada: I would say yes. But, there is always a “but.” Let’s say, theoretically, yes. Practically, it’s a question of time. Sometimes a customer gives us a watch from the 1970s that you we can easily maintain, no big deal. But if the dial is totally broken, you have to replace it. When we have no more dial of this reference in the inventory (because we do keep a big inventory), we have to redo the dial. If we redo the dial, it’ll probably cost half the price of the watch itself, and that’s something we have to explain to the consumers. So I would say, yes, we could – but not at any price, and not within 10 days. It’s like the vintage car, it’s like the vintage bike. And people normally understand this. After all, it’s a question of, could I afford a new dial for my father’s watch which costs US$5,000? I exaggerate it a little bit. Alfred: I’m just asking this question because, as media, I think it’s important for me to explain this to our readers. There are plenty of new brands out there which we call independent. They do not have the history of Zenith, and it makes people wonder whether the watch can be restored and whether the brand will still be around after a few years. Aldo Magada: That’s a valuable question. A lot of independents are doing great pieces, but when you have spent so much money on a beautiful timepiece, you must consider what will happen in 10 years. It could be a one-man operation, or a brand established in, say, 1845 but that for some reason stopped operation for more than a century, and has now come back. What do you do with the vintage pieces? Don’t forget that Zenith is one of the few brands, which has been in business continually for over 150 years. So basically, we know what we did for the last century-and-a-half. And it’s a big responsibility, I agree with you, it’s part of the value of the product. If you cannot repair, it leaves a big question. Alfred: The next question I’d like to ask is more specific. Elite and El Primero: in your interpretation, what’s so special about these 2 movements. Especially the Elite, as well. Aldo Magada: Well, El Primero, I don’t have to tell you about because this is the only high frequency chronograph on the market. Of course, a lot of brands had limited series of 1000 pieces or so, but we have been producing them since 47 years ago. This chrono is not just aesthetically beautiful, but don’t forget that when you are a manufacturer, you also always try to have something new. It’s 6.9mm, very thin, very refined. As a manufacturer, though, we would always like to add something new on top of it. Elite is comparable to the ETA movement, more or less sharing the same dimensions. And it was an ETA for us, as a three-hand independent movement. It’s a good movement in terms of performance, outperforming the ETA 2892. It also outperforms, of course, the ETA 2000, which is maybe a comparable product because of its size. But what is important is we put at least the same care into the Elite that we put into the El Primero, and that has to do with the finishing. It’s really a manufacture movement. So at the price of the regular industrial movement range, I would say you would have no complaint about it. Alfred: I believe that in the current market, people are looking for value for money. And for me, I think Zenith represents for one of these brands watch lovers would be looking at for something other than ETA. How about any other haute horology pieces that you have done? I understand that you also have the tourbillon watches, of course. Aldo Magada: Yes, we have the tourbillon on the El Primero chronograph. This movement has been around for a long time. The price of the watch is about CHF49,000, so of course it’s a lot of money, but if you compare with the tourbillons of other manufacturers, it’s very affordable. The tourbillon is one thing, but we also have the zero gravity that is not compensating the gravity on the escapement, but eliminating its effect because the escapement always stays on the same level. And that, for us, is a good way to define Zenith. It’s a unique answer to very old and common questions about this gravity problem. It’s very simple in terms of concept, and it’s very complicated in terms of how you do it. And that’s exactly what we love at Zenith. It has to be an elegant solution: simple in the concept, very sophisticated to accomplish. Alfred: It’s very sophisticated in a way. Tourbillons these days are more for showing artistic decoration of the movement itself rather than the compensating the gravitational force. (Aldo Magada: Yes, it an animation, because it’s turning). But for the Christophe Colomb watch, you have a real solution. Aldo Magada: It is a solution. It’s also a fun way to play with your watch. You become addicted to making sure that in every position of the watch, the escapement is still in the same position. I tried everything – I can show you. Fortunately, it works. Alfred: On your collaboration with Cohiba, could you tell us again, for our readers, how it happened? 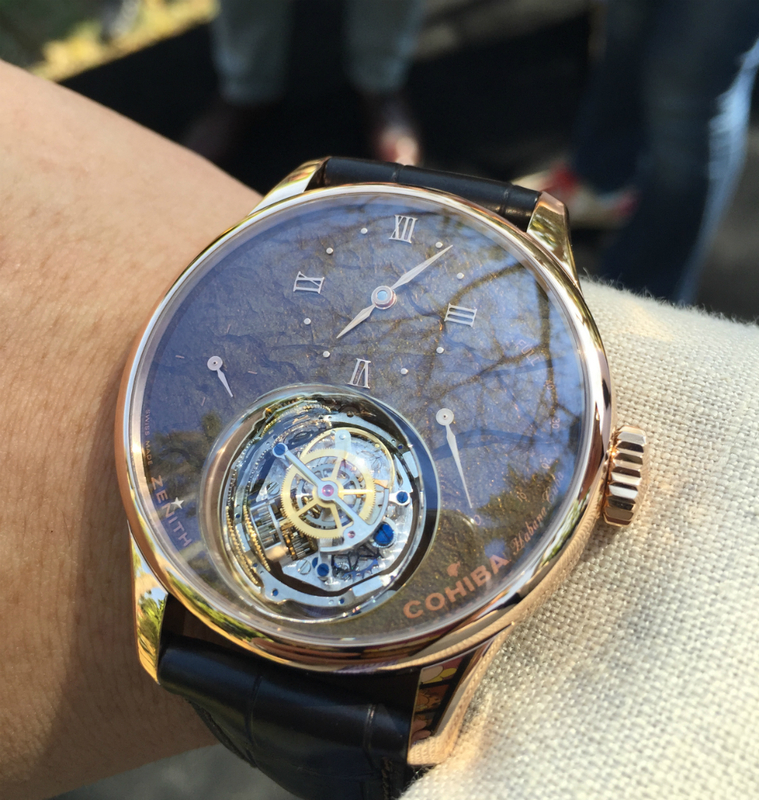 And what’s so special about this dial that you have on the Christophe Colomb watch? Aldo Magada: It started with an email and then a meeting with a great guy named Javier. At that time, I didn’t know it was for Cohiba, I didn’t know it was the 50th anniversary for Cohiba. 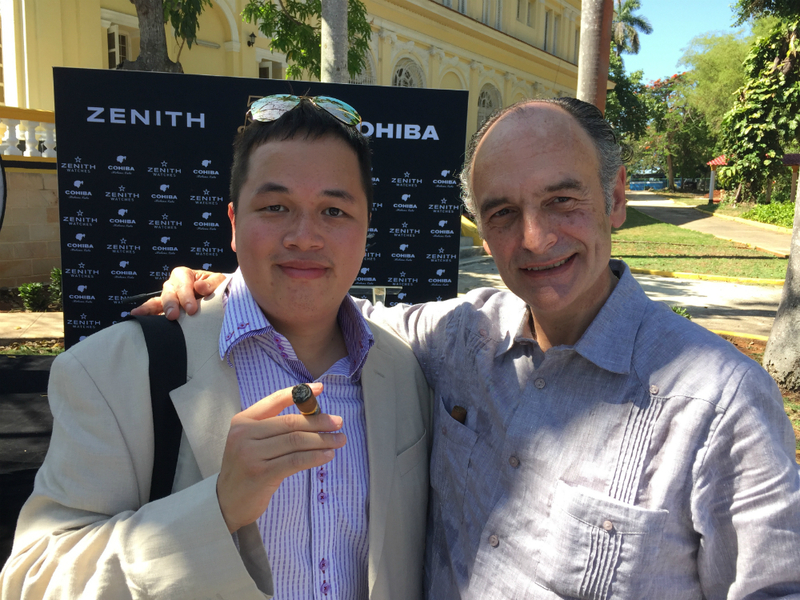 So when I discovered that, I was not only thrilled because Cohiba is a flagship brand of the Cuban cigar, but it is also an incredible association for us – not only for marketing reasons. Cohiba is a brand that stands for excellence, and that is exactly what we try to achieve with our movements, with our watches. Now, about the dial, the problem when you do co-branding is that you have to be very careful on this kind of price positioning not to make a merchandising product because if you do a little bit too much merchandising, it will lose total value. When we do this co-branding, we not only think of this watch as for the celebration of Cohiba’s 50th anniversary, but it has to be a product you will wear in 5 years. 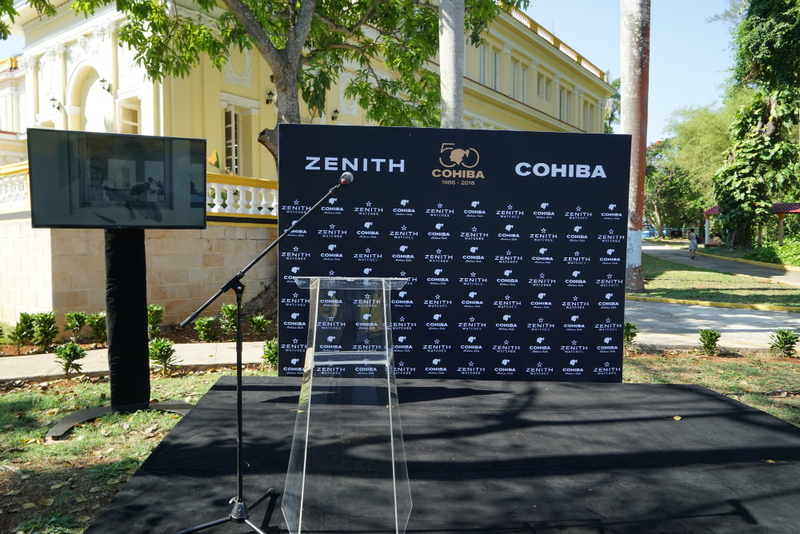 For the dial, as a partner, we have to incorporate the Cohiba brand graphics always with a position at center stage. So That’s why we created this dial for Cohiba. It reminds one of the ring of the cigar, and of course the color evokes the color of tobacco when it’s fermented. The globe look is still classy, so you will not be ashamed to wear this watch in 5 years, because it looks good. That’s why we did this kind of dial. Alfred: Speaking of trends in 5 years, obviously even within LVMH brands, there are smart watches coming into play in the market. How do you see the smart watch market compared to a brand like Zenith? Aldo Magada: Well, basically, we have been doing smart watches for 150 years. But we are doing it in a mechanical and analog way! For the connected watch, we have the chance to have our sister company TAG doing an absolutely fantastic connected watch and harnessing the unique power of Mr. Biver in communication. And now, my question is: is today’s connected watch market the market of the future? Because we asked ourselves a lot when the Apple watch came out. I bought an Apple Watch because I’m an Apple fan, and after 3 days I stopped wearing it because I didn’t see what benefit it provides to have what you can have on your phone on your watch. A lot of people can forget about this and go for Fitbits because they need to know their health-related statistics. I think the development of connected watches will go tremendously in a different direction when the device is totally independent from the phone. And I will say that it will probably be a great tool to use. Now, the question is when and how we will do it. Alfred: The way I see it, the Apple Watch looks great now, but in 5 years’ time, it will be obsolete. Do you agree with that? Aldo Magada: Well, it will be obsolete. Basically, OK, the volume they are doing is always impressive, so we have to consider what is comparable. For Apple, when they release a phone, normally the first weekend they do 5 million pieces. It didn’t reach the same dynamic with the Watch. They lower the price by US$100, and that means they are thinking about a new generation, which I understand is coming. Or, there is something wrong in the concept, because the concept itself… I’m not sure about it. Alfred: But looking at the bright side, the way I see it is that it can attract Apple fans who were not watch fans to have something on the wrist. Aldo Magada: That’s a good thing for us because it’s exactly what I called “colonization of your wrist.” Because a lot of young people don’t have watches, and to have an Apple watch, suddenly they have an accessory on their wrists, and that could lead to interest in the watch world. Alfred: Yes, that’s what I see in it. Everyone has to start somewhere, so they start with an Apple Watch. But later on, when the user got used to something on their wrist, they will look for an upgrade. Like me, if I don’t wear something on my wrist, I will feel naked! Aldo Magada: Yes, definitely. And now because I’m working in the watch business, for me, the watch has to be here, it’s part of me. Alfred: Totally agree. And now, I would like to ask something outside watches. What do you like to do other than working in the watch industry? What do you enjoy doing in your life? Aldo Magada: Being with my family and being with my friends. For example, I have friends who smoke cigars. Every week, we have a kind of time for us on Saturday. I like to drive if I can drive classic cars. I like to enjoy life, having good fun with people. After all, of course, it’s classic things: reading books, watching movies. I’m not going outside a lot because when I’m working I meet a lot of people. So when it’s out of my job, I try to really focus on my family and my friends. Alfred: I understand you have children. (Aldo Magada: Yes, two.) As I understand, you’ve been in the industry for quite a long time. And this industry is actually quite good about passing onto the next generation. Will you be recommending your children to join the watch industry? Aldo Magada: As you know, it’s always the same for fathers. You secretly think or hope that they could be interested in something, but I don’t have my own company. It’s a different story when you are a manager than when you are the owner of the company. But let’s say you are the manager, I secretly hope that, for example, my son could be interested in watches. But that means to love watches. I love cars, but I will never work in the car industry. I’m too old anyway. So, yes, but you never decide for your children, so let’s see. Alfred: Out of all those countries that you have traveled, which is your favorite place in the world? Alfred: Out of all the cuisines that you have had when traveling around the world, you mentioned Italy, is it Italian cuisine that is your favorite food? Aldo Magada: Italian cuisine is one of my favorites for one basic reason: Italian cuisine works around the product. There’s no sauce to hide, there’s nothing, you just cook properly. And I love pasta, you can have so many sauces, so many different tastes. But I like all the cuisines, I’m crazy about Japanese cuisine. I love the Chinese cuisine, but the one from the south, Guangdong. So it really depends. Similar to wine, if you said you just like Bordeaux, I think you are missing a lot. And in China, I know food is something very important. And I like it, because people are very serious about food and cooking. Alfred: Yes, I use cooking as my way to relax. Aldo Magada: Yes, it’s a way to relax, because you focus on what you are doing and forget everything else. Alfred: Yes, we are very serious about our food. That’s why you probably find the best cuisine around the world based in Hong Kong. Thank you very much, Aldo. Aldo Magada: Thank you very much, Alfred.